Following Google’s rollout of a new Hangouts service for mobile and Google+, the company is giving Gmail users the opportunity to replace Google Chat with Hangouts integration. But heavy users of Google Voice may want to hold off on the switch, because the new Hangouts feature kills your capability to send SMS messages and make voice calls to landline and mobile numbers from Gmail. The good news is this is just a temporary, yet annoying step. "We believe Hangouts is a better communications product for Gmail users than Google Talk," a Google spokesperson told TechHive. "But there are a few features that aren’t in Hangouts yet, including voice calling." 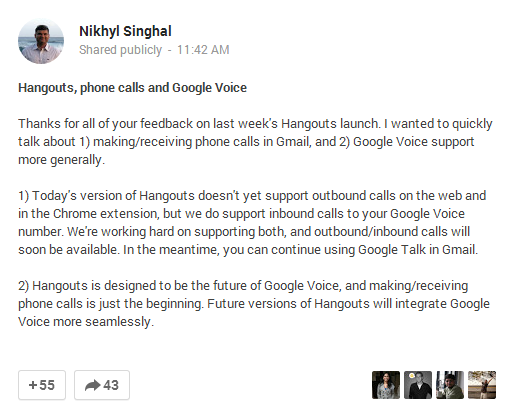 In a post on Google+ Monday (shown below), Google product manager Nikhyl Singhal called Hangouts the "future of Google Voice." He also noted that while Hangouts can't yet make outbound phone calls it can receive calls made to your Google Voice number. Google has offered Hangouts integration in Gmail since last July when the company simply added Hangouts to your Gmail Chat options. You could still call your Gmail contacts from your inbox, make private video calls, and, of course, trade instant messages. The new version of Hangouts for Gmail eliminates Google Chat and replaces it with Hangouts. This feature supports video calls with up to ten people at once, and lets you trade emojis and send photos. The new Hangouts experience in Gmail looks similar to the new version in Google+. 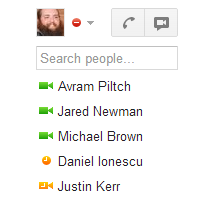 It lists recent Hangouts at the top, and other contacts are listed below. But Hangouts in Gmail did some strange things during my brief tests. Not only did I lose the capability to make phone calls and send SMS messages from Gmail, but some of the people who regularly appear in my chat list completely disappeared—even if they were in my Google+ circles. In some ways this is a good step, since Google+ had the annoying habit of adding people to Chat in Gmail that you didn’t necessarily know. But Hangouts also buried some of my regular Chat contacts even if they were online, and they reappeared only when I did a manual search for them. Once I opened a chat with a buried contact, however, they returned to the top of my list as a recent conversation. Bottom line: If you rely on Google Chat on a daily basis, you may not want to switch to the new Hangouts for Gmail right now. The switch may mean some of your contacts will disappear or be harder to find, at least for the moment. You will also lose the ability to make phone calls or send text messages. Google first brought phone calls to Gmail in 2010. At the moment, you don’t have to switch permanently to Gmail for Hangouts; Google allows you to switch between Hangouts and Google Chat in Gmail. 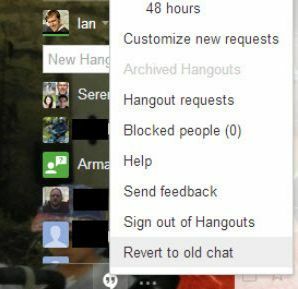 Just click on your profile picture at the top of the Hangouts/Chat area and select “Revert to old chat” in the pop-out menu that appears. Google Voice users could also simply open the Google Voice Web app and make calls from there instead of switching back and forth. It’s not clear when switching to Hangouts in Gmail will become irreversible, but the Google spokesperson suggests it will happen eventually. "Once we add these features, the spokesperson told TechHive, "we’ll consider removing the opt-in and updating Talk to Hangouts in Gmail, much like we updated Google Talk on Google+." Google Voice hasn’t changed much since Google opened the service to all U.S. users in 2010, but the company hasn't forgotten about the service. Regular Gmail chat still includes call options. Early builds of Chrome on Google’s nightly Canary builds channel allow users to use the Hangouts Chrome extension to receive phone calls from Google Voice numbers, according to The Verge, which was first to spot this whole problem in discussion on Google support forums. Last Friday, Google’s community manager for Hangouts accidentally revealed that SMS messaging will come to Hangouts in the near future. Also, with Microsoft integrating Skype into Outlook.com, you have to think Google wants to stay ahead of its rival by keeping intact SMS messages and voice calls from the inbox. Microsoft hasn’t integrated Skype phone calls into Outlook.com yet, but the company has said more features are coming to Skype in Outlook.com. Updated 05/20/2013 at 10 a.m. PDT: Nikhyl Singhal, the product manager for Hangouts and Google's other real-time communications tools, took to Google+ Monday morning to clarify the situation. Updated 5/20/2013 at 11:15 a.m. PDT: Comments from Google spokeperson to TechHive inserted.